Eberbach Model EL680-HD Heavy Duty Hand Motion Shaker w/ Four SS Holders . New Life Scientific, Inc.
* Handle arms can hold up to 10 lbs. Our onsite New Life Scientific technicians confirmed that the shaker operated up to 960 shakes per minute. The 'rubber band' holders were not included, but the plate racks are present. 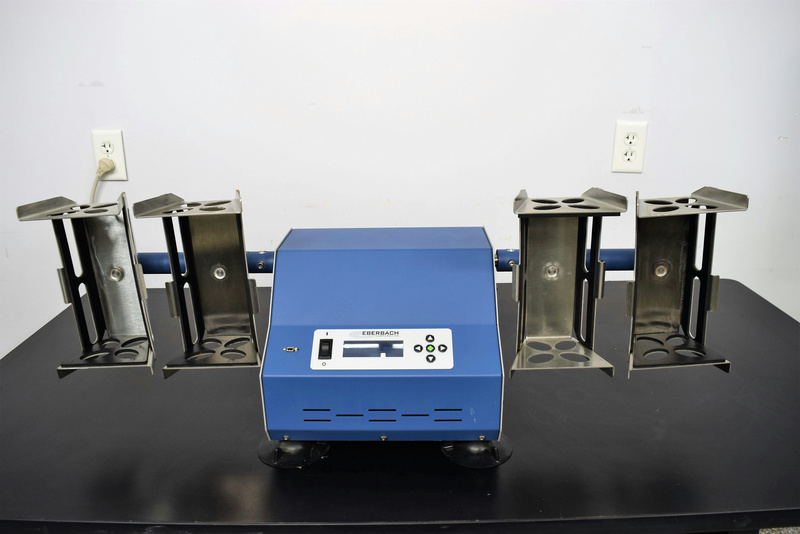 The shaker is an effective tool for extracting, dissolving and emulsifying samples. It comes with suction cup feet but will need to be on a sturdy surface. This is a heavy duty shaker and can hold up to 10 lbs on each handle. Missing is the bands that hold the containers to the device. Easy to operate and read LED screen for speed and timer settings. This is a current model from the manufacture, retail pricing for a new one is $3250. At the price we are offering this would be a valuable asset for any lab.